Third Quarter 2014 Condo Insider Report - Insider News ! As expected the Biloxi and Gulfport high-rise beachfront condo market had a slow down from the 2nd quarter to the third as the summer season drew to an end. Inventory is up as sellers added more condo units into the market. Either to try and capture the summer buyers or in anticipation of the fall rental slow down. The third quarter of 2014 ended with 77 active listings up 13% from the second quarter. Total sales were down 15% quarter over quarter along with the average selling price per square foot. Cash remains the dominate source of funds with 55% of all transactions closing with cash. Looking into the fourth quarter, I anticipate it to be a better quarter than the same period in 2013. The number of inquiries and buyers actively looking has continued beyond the summer season.The exposure that the MS Gulf Coast received from the HGTV show Beachfront Bargain Hunt; staring me, had a positive impact on our buyer traffic. I continue to receive interest from across the country. if you have any questions or need more information, please call or email me. 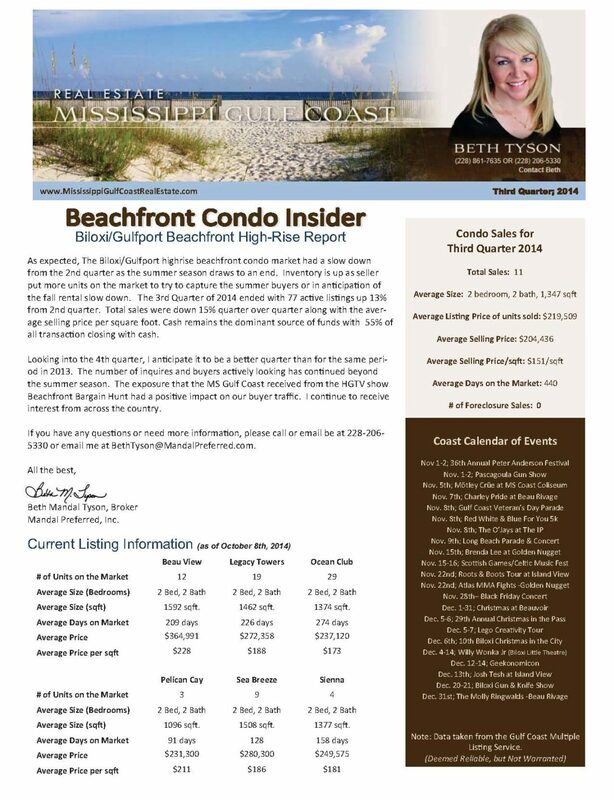 – Detailed information from a Broker’s perspective on the activity of the beachfront condo market in Biloxi/Gulfport, Mississippi for the Third Quarter of 2014.